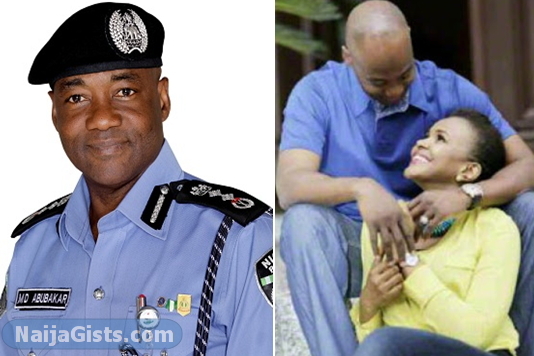 Over one year after the death of his wife, Maryam, Nigeria’s IGP, Mohammed Abubakar is set to give marry a try again. Maryam passed away in January last year after a long time battle with Ovarian cancer. 53-year-old Mohammed Dikko Abubakar is currently engaged to marry a 35-year-old woman named Safiya. According to sources, a 3-day engagement ceremony will precede the wedding that is set to take place on the 14th of September. Body no be fire wood o.
Wow! Wat r lovely couple. Alwayz remember 2 put ur heads 2geda az one one n always put it at d back of ur mind dat marriage iz an evalasting fidelity. I wish u d very best in life! Death is inevitable. When it comes, there is NO I am not going. Life must continue. I wish the new wife ‘HAPPY MARRIED LIFE’. Give him maximum co-operation so that he will not regret marrying you. Oga IGP, Please always keep this new wife on a constant medical check up,for once bitten twice shy.CANCER HAS NO RESPECT FOR GUNS AND IT CAN BEAT EVERY SECURITY.congratulationnnnnnnnnnnn. CONGRATE OUR IGP IN ADVANCE FOR FORTHCOMMING WEDING CEREMONY I WISH YOU HAPPY MARRIED LIFE AND LONG LIFE AND PROPERITY. Happy marriage life, I wish both of you long life and prosperity sir.